Scott Brown enjoys a beer during Homecoming at Boulder Field this past Saturday. He spent time tailgating with students and alumni. 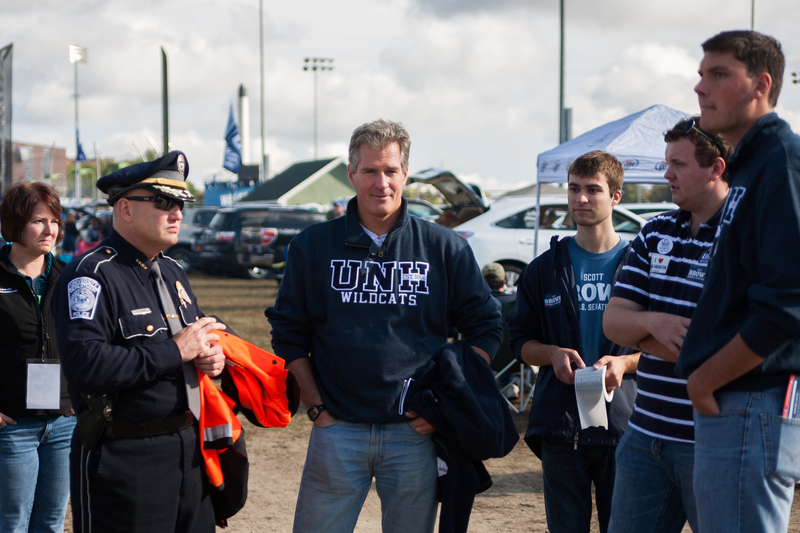 Scott Brown was casual and subdued when he arrived at the University of New Hampshire’s Homecoming tailgate party on Saturday. The scene that greeted him, however, was not. Boulder Field was packed with tailgating students, families and alumni going back decades. There were people dancing on top of cars and blasting music from their vehicle’s speakers. There were hundreds of grills belching smoke into the crisp mid-50 degree air. The cloud cover had broken up since the morning when the day’s business of celebration had begun. The New Hampshire U.S. Senate candidate made a discreet entrance onto Boulder Field on foot, escorted by Police Chief Paul Dean and a few members of UNH College Republicans who had helped to organize the event. 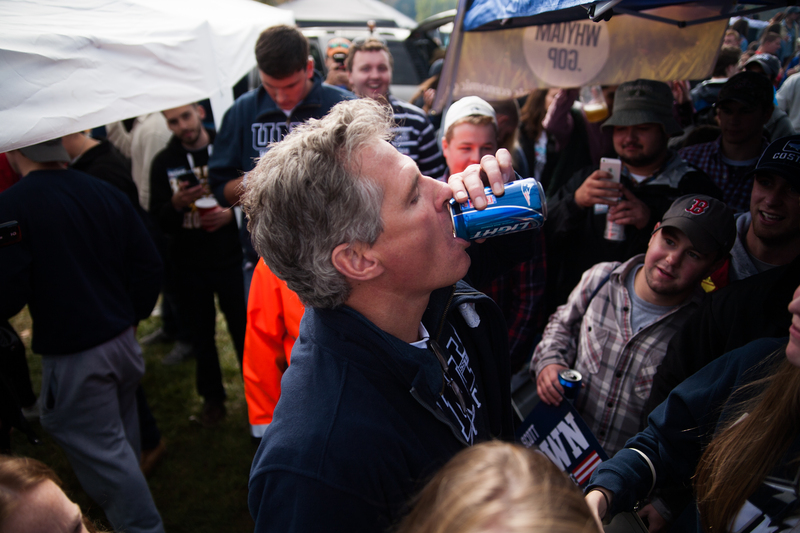 It was not long after Brown’s arrival that a student caught up with him and asked if the former senator from Massachusetts would shotgun one of the two cans of Bud Light with him. “Not with the police chief right here,” Brown joked. Brown was dressed in jeans, a UNH Wildcats sweater and a black jacket. Though he was primarily present in a casual capacity, he did discuss what he felt were important considerations for college-age voters. Scott Brown, escorted by UNH Police Chief Paul Dean, enters Homecoming. He spent his time talking to students, and catching up with an old basketball referee from Tufts. When Brown was in the thick of the 500 odd cars parked bumper-to-bumper and the shoulder-to-shoulder crowd jammed around the vehicles, the word of his presence began to spread. Here, Brown accepted a can of Bud Light from someone but, despite the urgings of the crowd, sipped the beverage rather than chugged it. “You guys are having way too much fun,” Brown said. But on the edges of this enthusiastic crowd, some of the students were less supportive. Other students disagreed with Ovitt. At the upper part of Boulder Field, Brown ran into Don Winterton, who refereed many of the basketball games Brown played while attending Tufts University. Among the merry-makers were people in animal costumes, including a bear, a cow and a chicken. Natasha McKenzie, College Democrats of America (CDA) president, had a response to Brown’s visit to UNH because people at Homecoming allegedly were making sexist comments. Brown declined comment. “Obviously, we encourage any candidate to reach out to young voters, but reaching out to young voters doesn’t mean putting up with offensive, sexist comments—or promoting them,” McKenzie said in a statement issued via email on behalf of the CDA press. “Scott Brown and his campaign’s initial unwillingness to address these comments speaks volumes about his character, and they have no place in our political dialogue. “With Republicans struggling to win over young people, and especially young women, it’s truly astounding how out of touch they continue to show themselves to be,” the statement continued. Around 3:30 p.m., Brown made his way to the football stadium, and watched the game fence-side while chatting with members of the UNH College Republicans. Overall, the UNH community at homecoming gave Brown a reception that was part positive and part negative, but most of the celebrants continued blithely unaware of the political machinations around them.